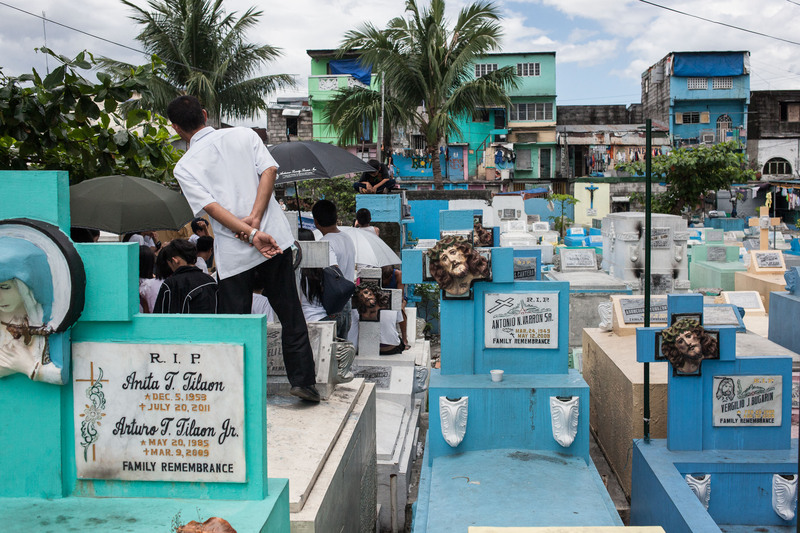 The 54-hectare North Cemetery in Manila is home to an estimated 6,000 residents. 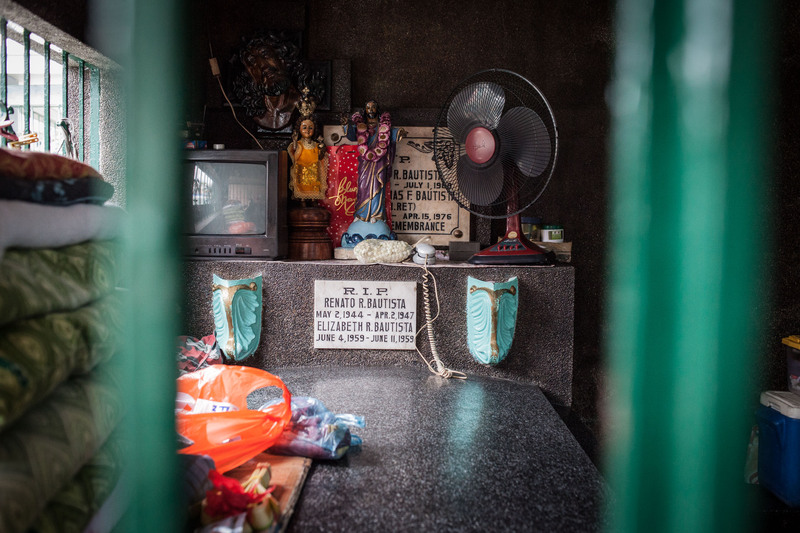 Residents of the North Cemetery have for decades used mausoleums as makeshift homes, bringing with them their few possessions. 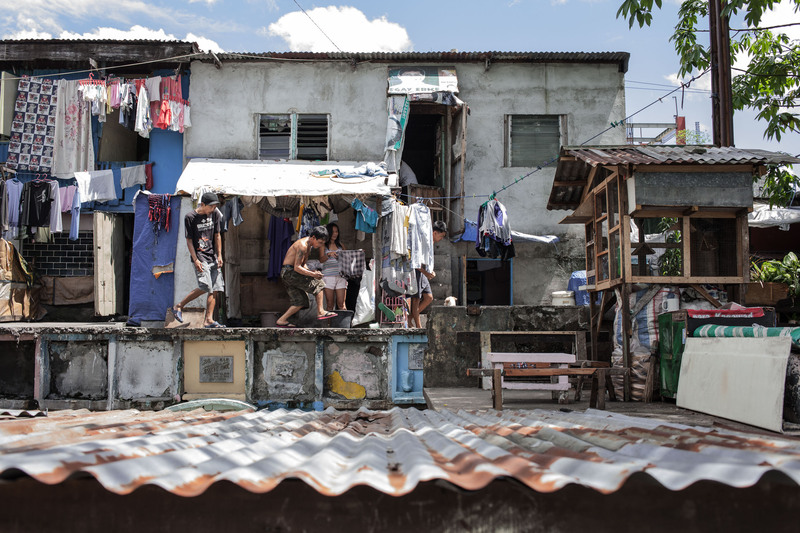 Prime real estate: Families like the Jimenez’s have lived for decades on top of the stacked graves against the back wall of the cemetery, hanging their washing on makeshift lines and cooking on small coal stoves outside the front of their homes. 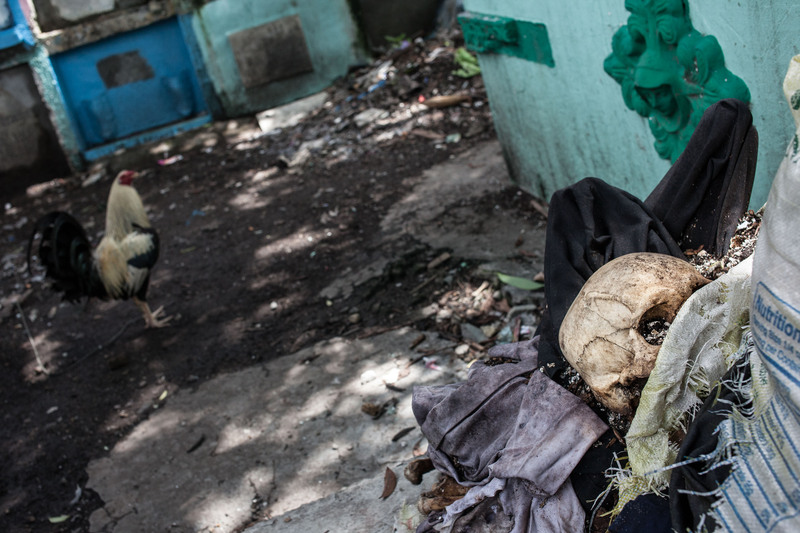 Skulls and other human remains are a regular sight across the cemetery, along with chickens and other sources of food. 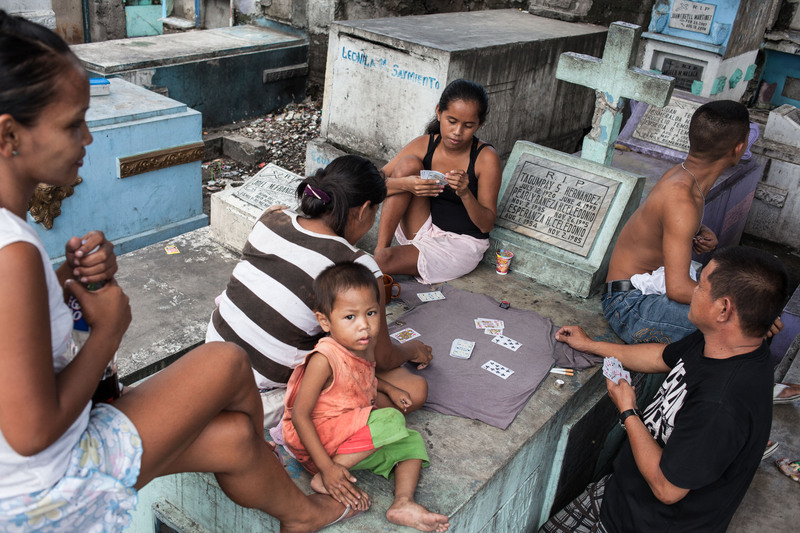 With space in the cemetery a premium, tightly packed tombs double as tables, beds and even places to gather around and play cards. 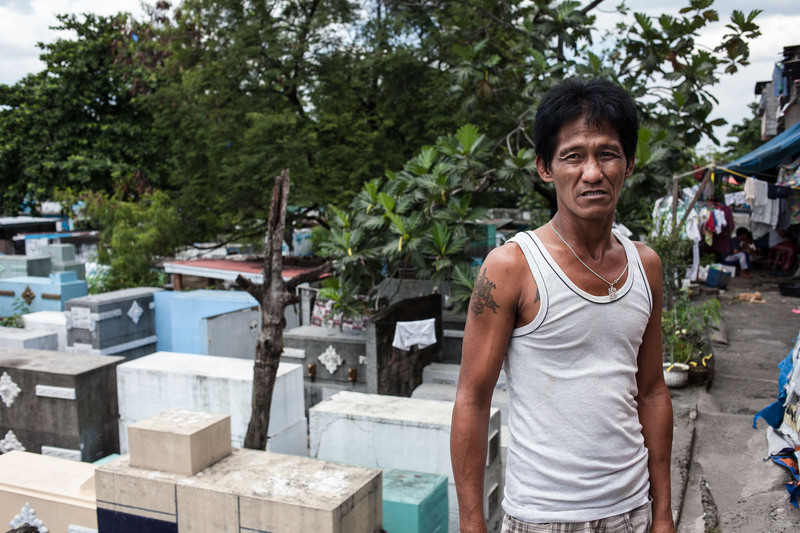 43-year-old Bobby Jimenez lives among the dead in Manila's North Cemetery and has raised all six of his children within its walls. 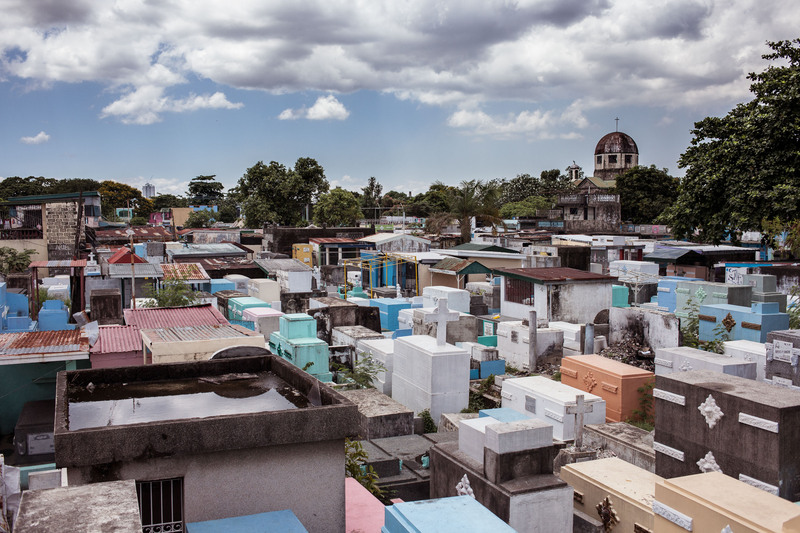 With so many new bodies arriving every day to be interred, the final resting places of the less wealthy are tightly packed and often stacked several rows deep. 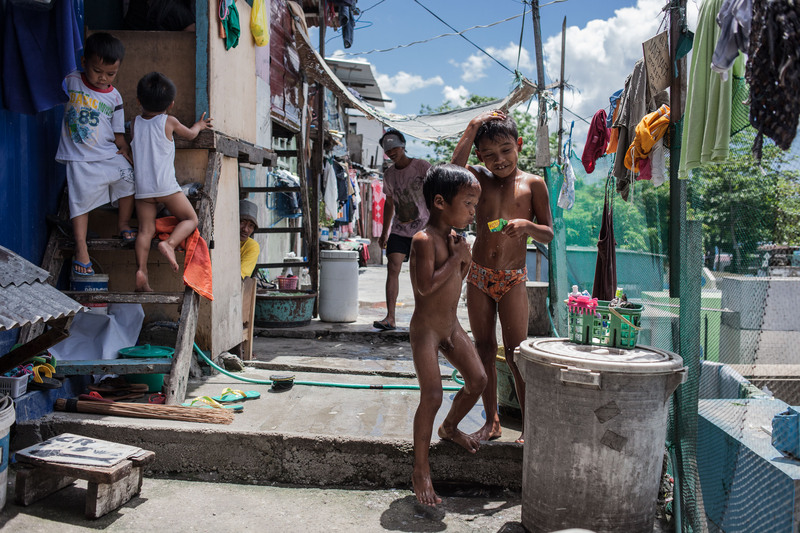 In the blistering sun, children wash using water hand-carried from one of the dozen wells scattered within the cemetery wall, while adults rest from the heat. 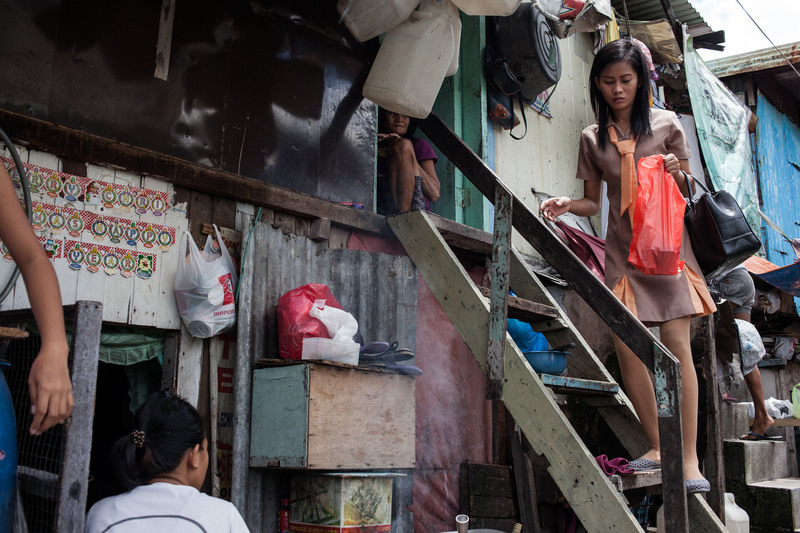 A woman prepares to go to work outside of the cemetery walls. 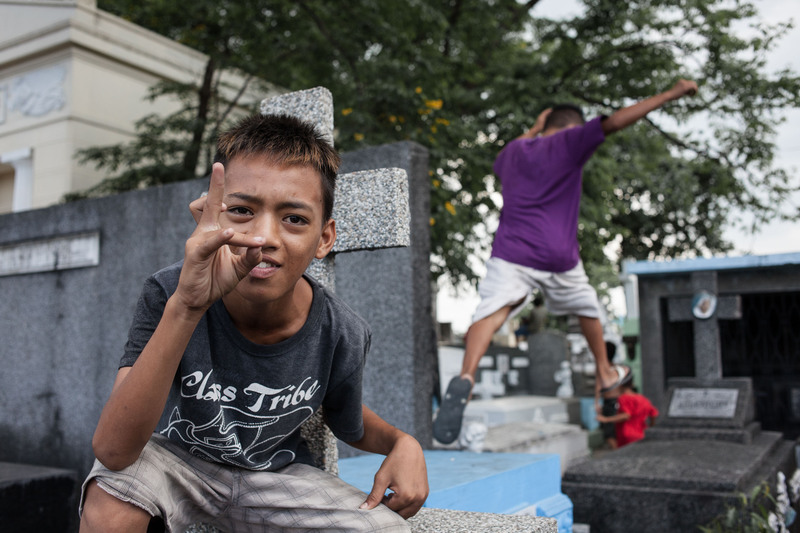 Every day upwards of 30 funerals take place, a constant reminder for residents of the true purpose of the cemetery. 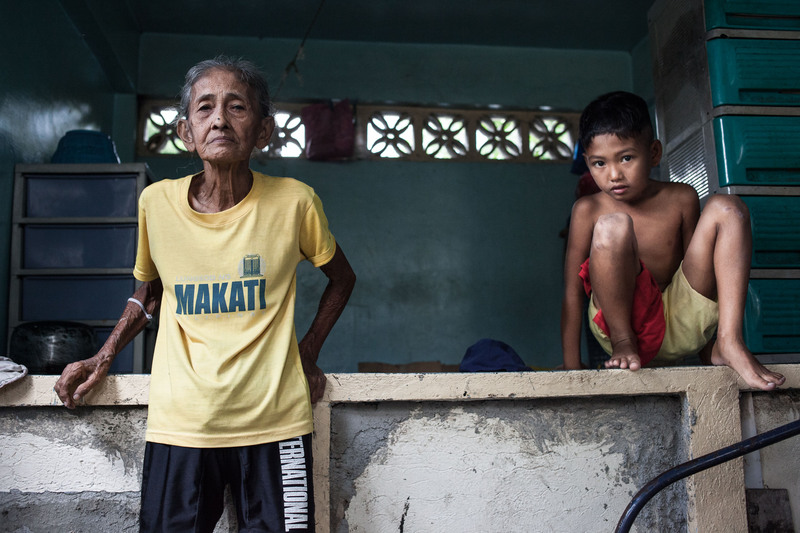 84-year-old Marcelina Laja Lobles has lived in the North Cemetery since 1951. 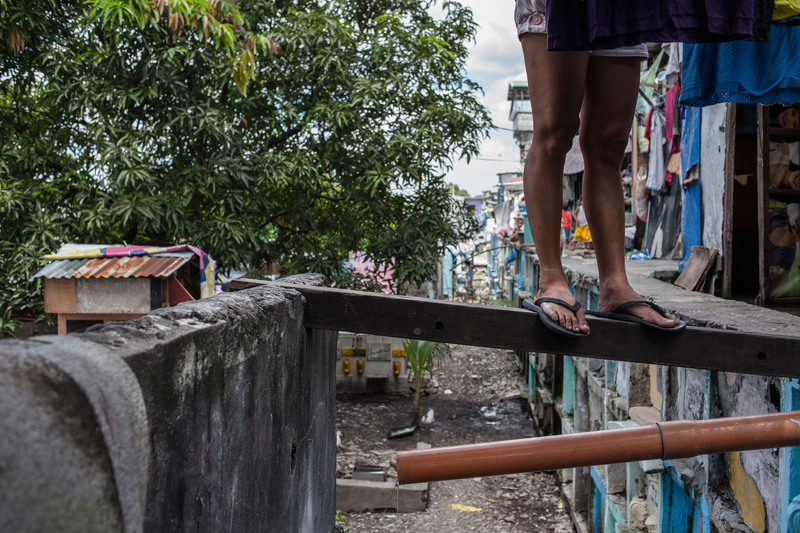 A simple concrete platform behind her acts as her bed and living space. 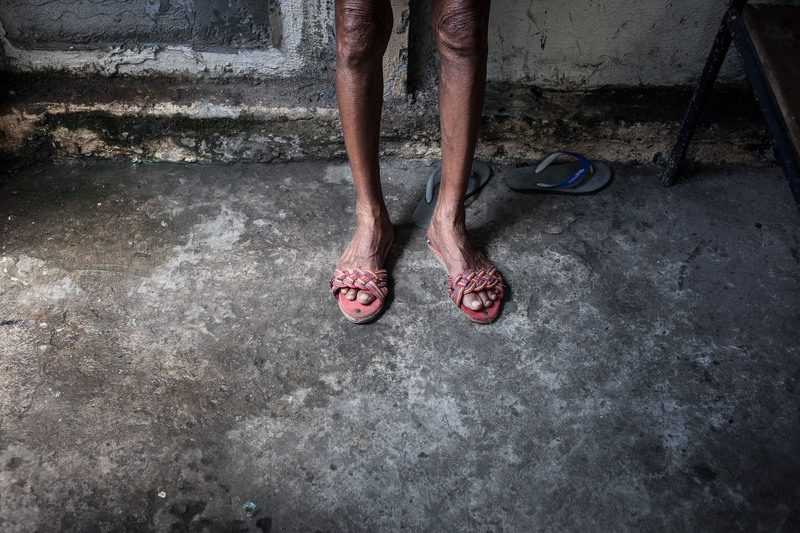 When she dies she hopes to be buried within sight of her basic home. 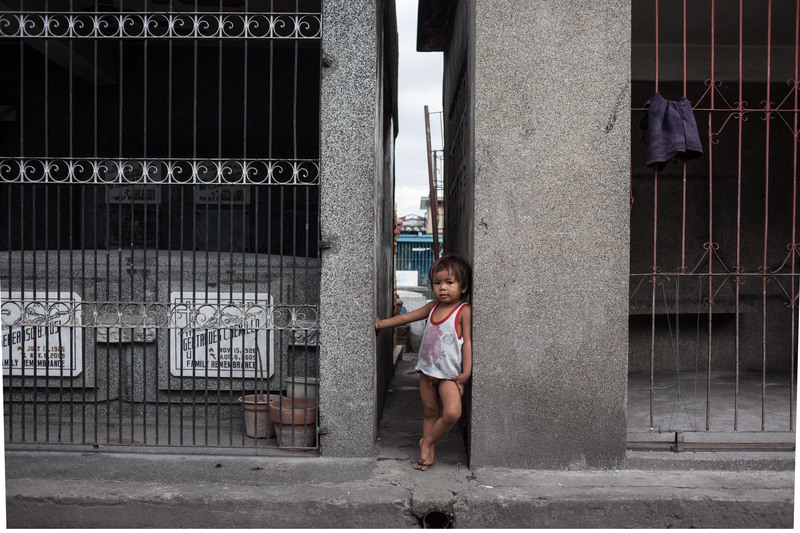 The North Cemetery is full of young children who have never known life outside the cemetery walls. 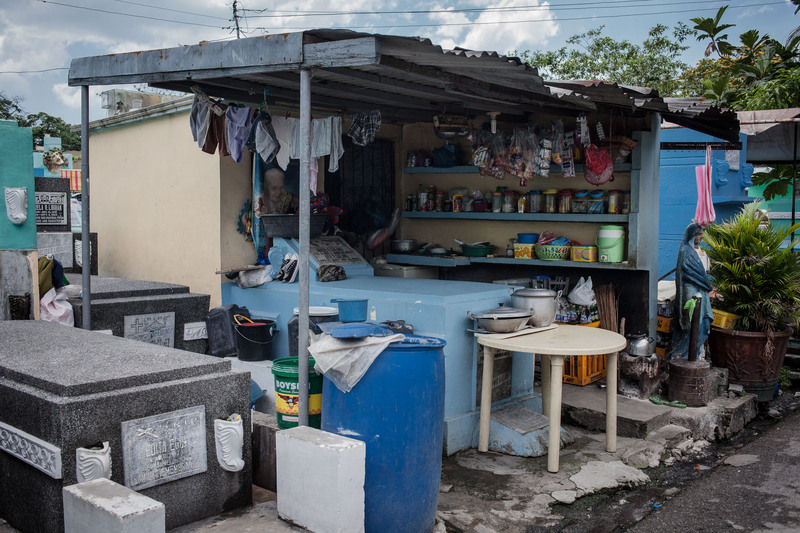 The North Cemetery has it's own self-sustaining economy complete with small shops. 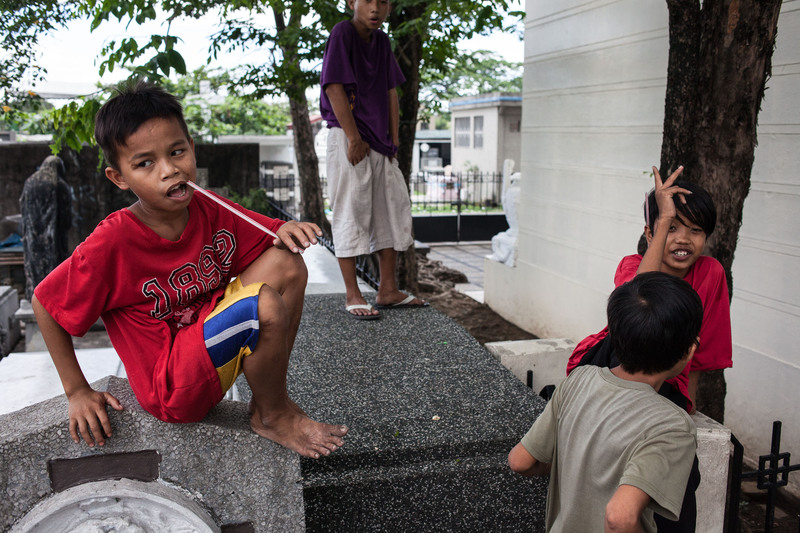 Young children who have grown up in the cemetery are at home among the graves and mausoleums. 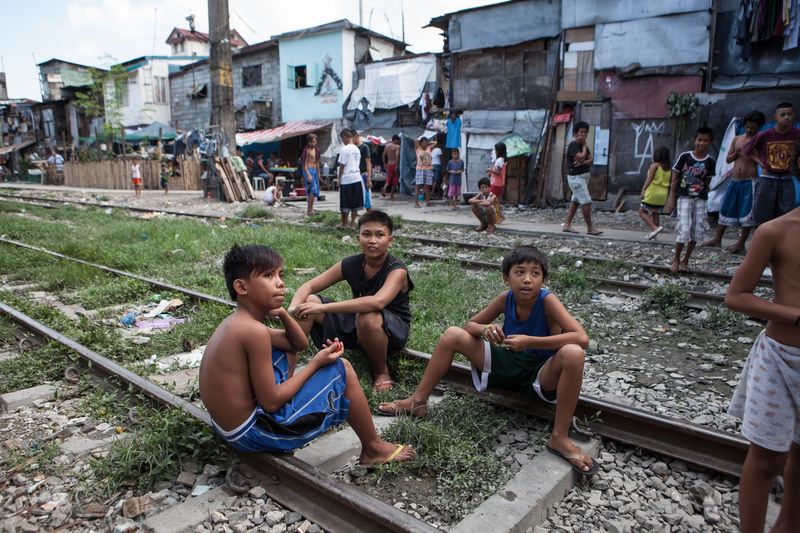 Most will drop out of school and will try to find informal work within the cemetery. 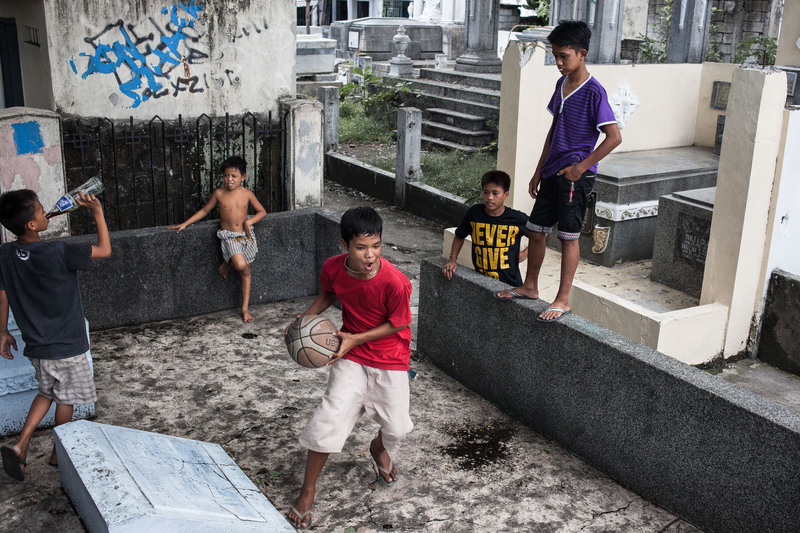 Children play a pick-up basketball game on top of tombs and grave plots in Manila's North Cemetery. 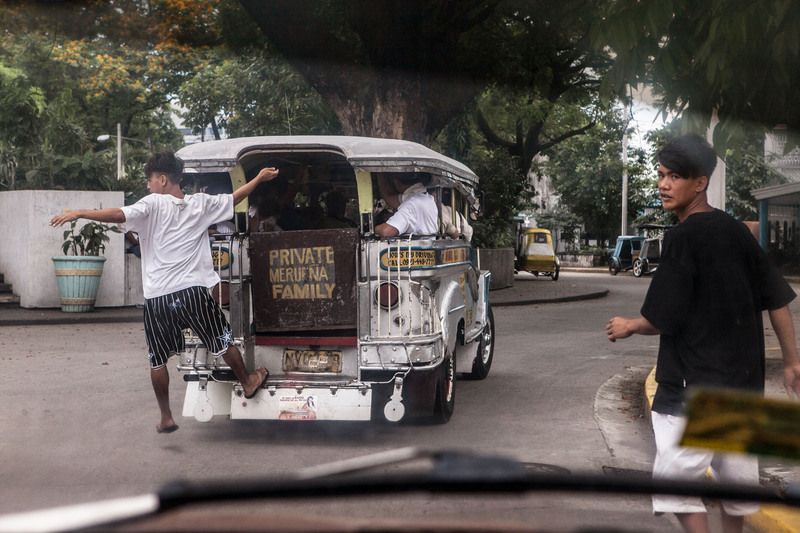 Young cemetery residents hop a ride with the funeral procession hoping to earn a little money in exchange for carrying the coffin and helping out with the interning of the deceased. 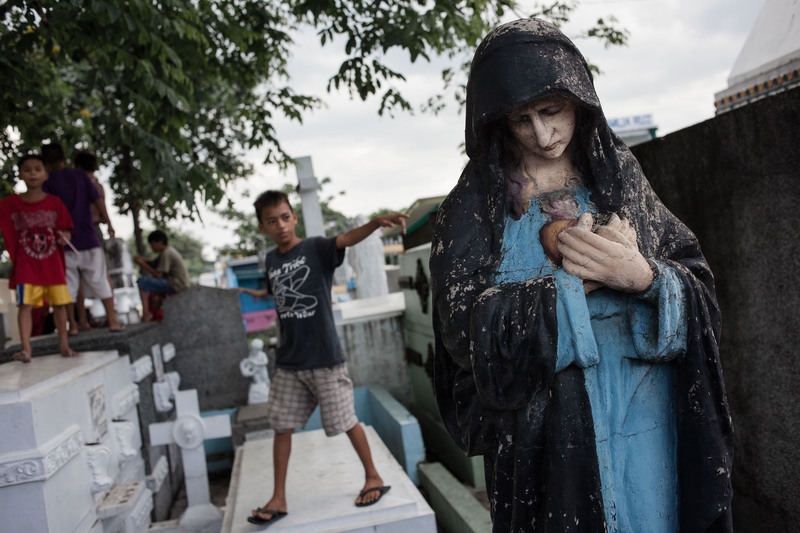 Fear of retribution against the grave itself means most mourners accept their service. 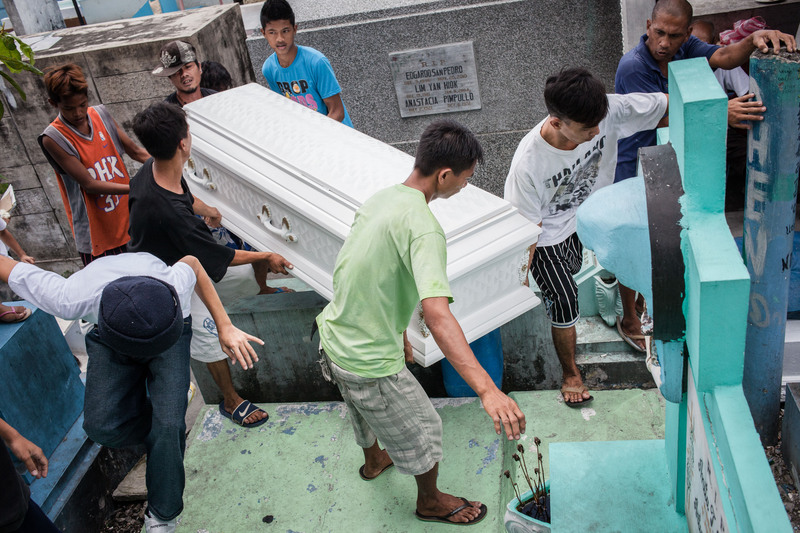 Residents from the cemetery are hired to carry and bury the deceased. 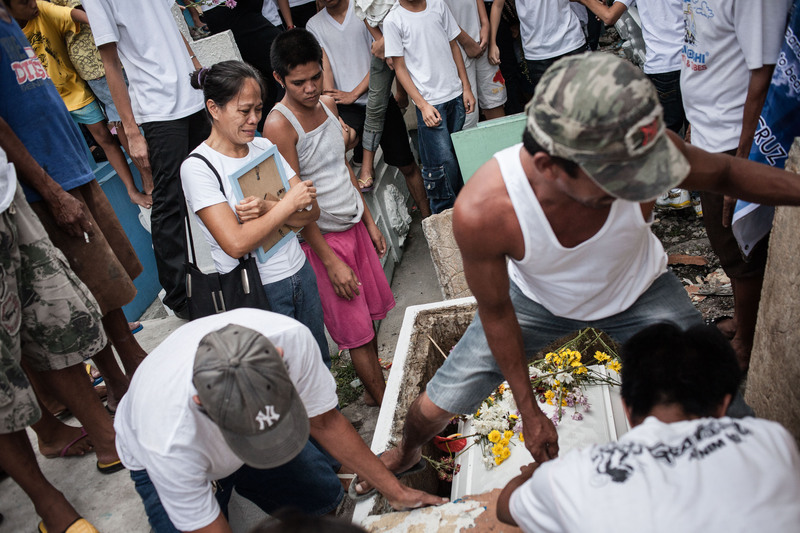 With space so limited mourners must stand on other graves in order to see the funeral service. 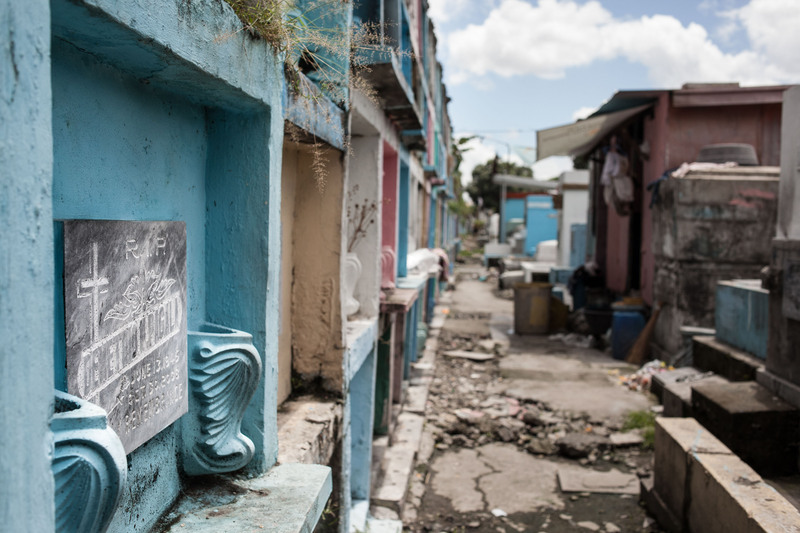 Few graves have dates older than three years, after which the plot is reused and the bones of the deceased are moved elsewhere. 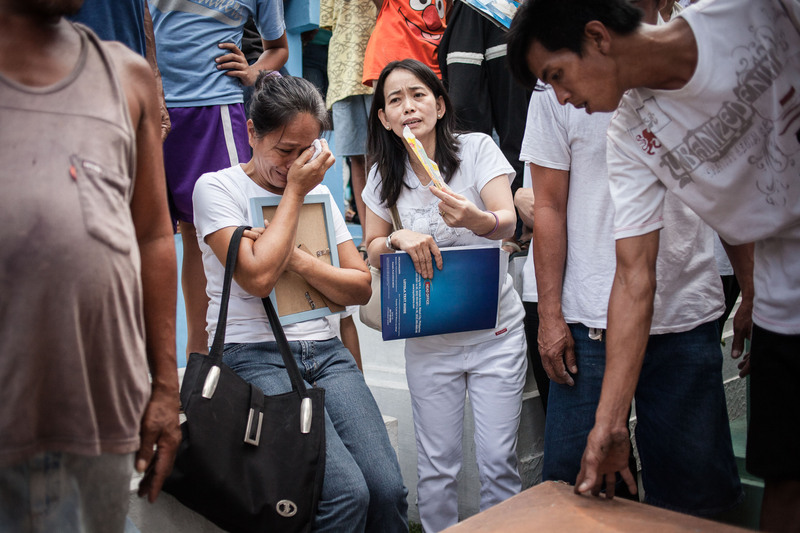 Families of the deceased mourn, while residents of the cemetery earn a little money helping to intern the body. 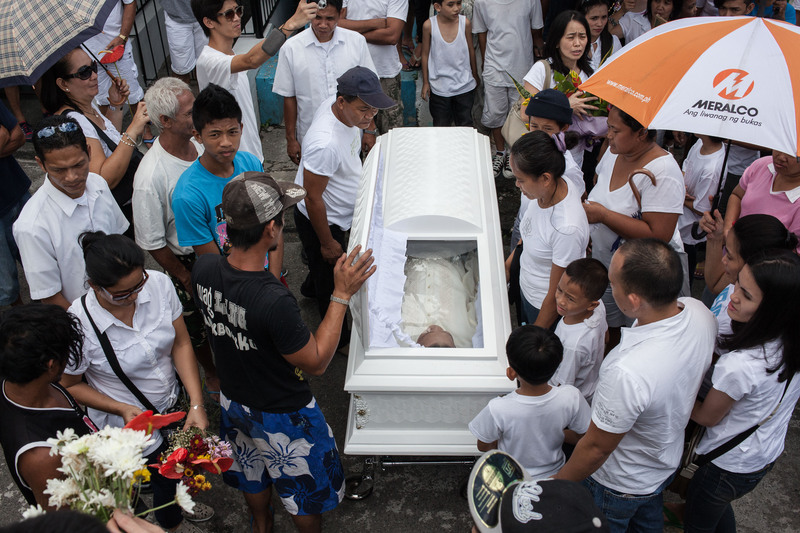 Personal effects are commonly found wide-open where the family of the deceased has decided to live in the mausoleum. 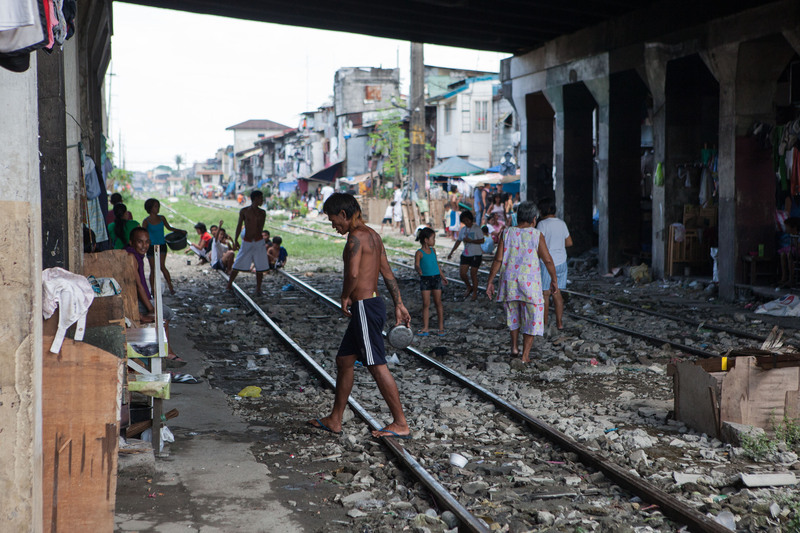 For many, the alternative to living in the North Cemetery is residing by the often more dangerous railroad tracks. 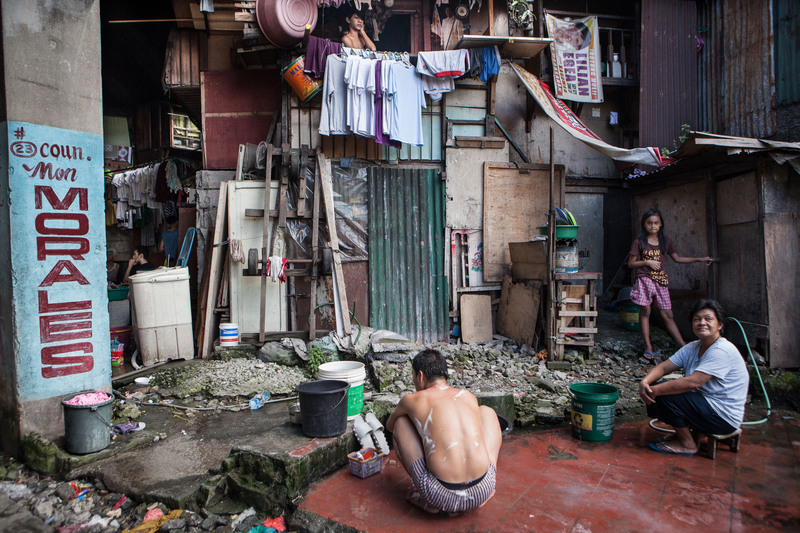 Most of the make-shift homes in the surrounding areas are made of abandoned wood, plastics and sheet metal.